The Alvin Community College Softball team will take the field with a new coach while the Baseball squad looks to build on its success as each team starts its 2019 Spring seasons. Athletics Director Bill Lewis said the softball team has the talent and potential to advance in the rankings of the NJCAA Region 14. The Baseball program likewise has a diverse mix of talent which will benefit the team. The women’s Softball team will start its season on Saturday, January 26 in the Galveston Invitational Tournament. The first home game will be February 9 against the University of Texas-Rio Grande Valley at 1 p.m. The Baseball team will start its season on Saturday, January 26 at home against Temple College at 12 p.m. 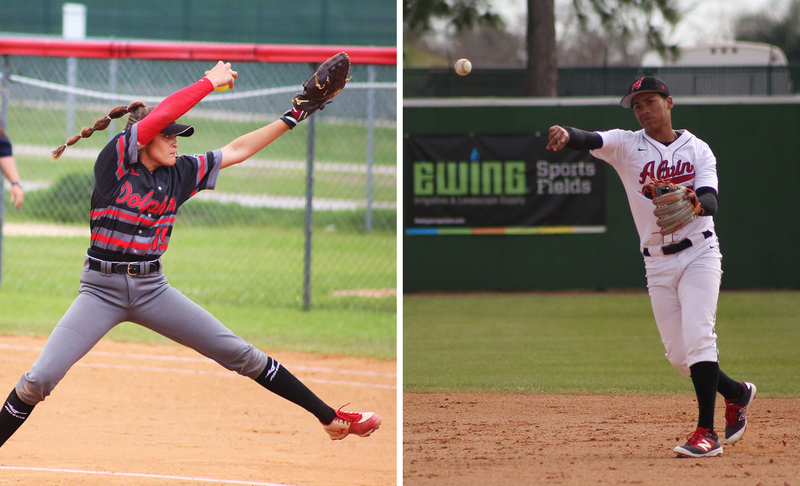 The Lady Dolphins posted a 14-27 record in 2018 and Torres-Farmer feels the team will definitely improve with four returning sophomores. The team has quality talent that will make them competitive in their region, she said. After a 30-27 season in 2018, the Baseball squad looks to break out this year with six returning players including outfielders Javeon Cody and Dylan Dougherty; first baseman Jaylin Turner and three pitchers Brian Dawson, Hunter Murray, and Kevin Roliard. “We will be a much better defensive team this year, with quality depth on the mound and an offense with more speed than we had last year,” Head Coach Jason Schreiber said. The 2019 team has a potent dynamic of speed on the field and power at the plate, he said. The Baseball team will have a number of talented freshmen who will develop, he said. “As the season goes on we need to keep growing up, we have a lot of freshman that will get playing time, we need them to get settled in, adapt to the speed of the college game and grow up fast,” Schreiber said. All games are free and open to the public. For more information or to take a look at the schedule, visit www.alvincollege.edu/athletics. ACC Softball and Baseball players in action during the 2018 season in this college file photo.